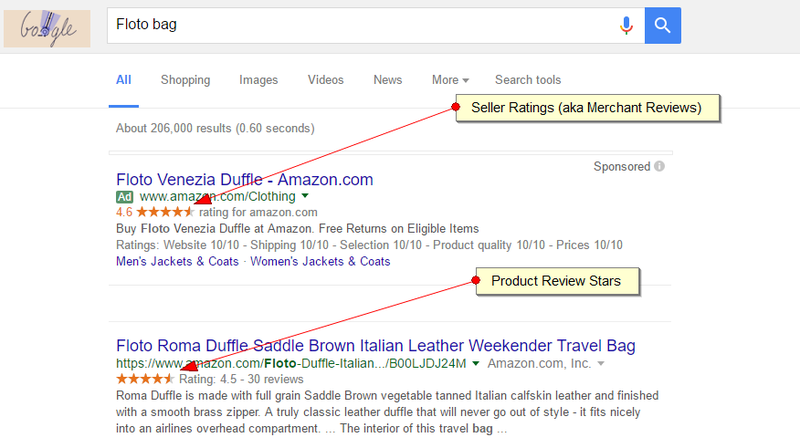 The stars that display in Google Organic are almost always product reviews. This post will cover how to get product reviews on both organic and Google Shopping. If you own an ecommerce company, this article is for you. Even if you’re a service-based company, you can still benefit from reading this post. Those that have questions on how to get stars in Google Organic & Google Shopping will find everything that they need to get started. If you would rather jump straight into Google Shopping reviews for your products and services, use the table below to sample some of the Product Reviews Aggregators that can be found out there. At the moment, there are 23 ‘Google approved’ third-party reviews aggregators that can fetch product reviews and syndicate them into Google Shopping. You must choose from this list or your stars will not show in Google Shopping (PLAs): https://support.google.com/merchants/answer/7045996? We have previously written an article in which we define Google Star Ratings and explain how you can get them. Needless to say here that Star Ratings are a review system that assigns between one and five stars to a product or service based on how it has been reviewed by previous customers. The golden stars, as we have already noted, display in Google Search results. They have the effect of instilling confidence in the buying public, by showing people that their peers have already tried out and liked a particular product or service. As a nation of non-stop consuming, reviews have become a big part of the consumer life cycle! The public likes to have the assurance that comes from knowing that other people have had good experiences with a product or service. Or, on the flip-side, we will avoid a product if it gets nasty reviews. That said, if negative reviews are handled properly, even these can work to your advantage. If you are an ecommerce site, how do you go about obtaining those all-important stars on an organic level and on Google Shopping PLA (Product Listing Ads)? Sometimes a CMS like Shopify or WordPress (Woocommerce) will have a system in place where your customers can come back to your website and leave a product review. The problem is that most people are just not bothered with leaving reviews. Using the CMS default option also isn’t fully automated the way Amazon and Ebay’s review systems are. While your CMS may generate organic product reviews, they will NOT go into Google Shopping PLAs. As of 10/3/2016 Google has given licenses to 13 third party review aggregators that can push your product reviews into Google Shopping. We have already given you, at the top, a table that shows some of these companies. These are the ones that we recommend to our readers, based on our own experience using them. 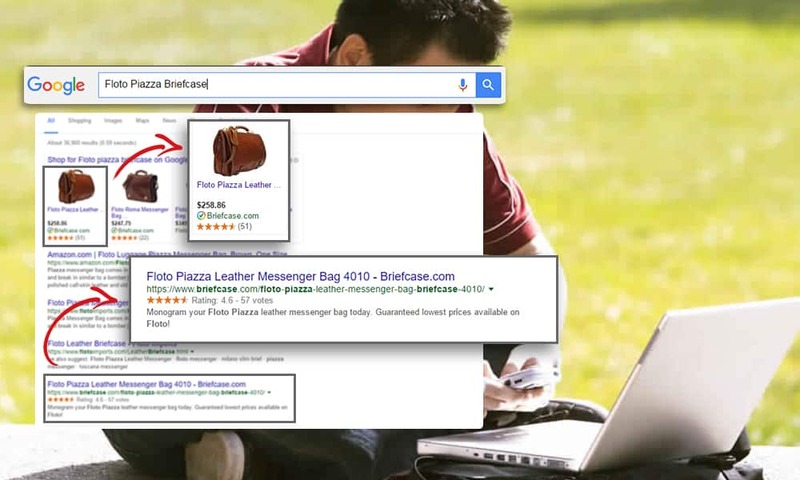 Product stars appear across Google Shopping AND Google Organic, as well as Bing and Yahoo!. If you want to see what the product reviews look like, check out Briefcase.com https://www.briefcase.com/floto-piazza-leather-messenger-bag-briefcase-4010/, scroll down and click on the “Reviews” tab. You’ll notice only Verified Buyers can leave reviews. In order to display product ratings on Google.com, your product (one product) must have at least 3 reviews. Your store must have 50 reviews combined spanning all products in order to get your stars to show. Offering both merchant and product reviews, Shopper Approved displays star reviews in your Google Product Listing Ads (PLAs) as well as in Google Adwords ads. This company stands out because it’s the fastest growing Google Authorized 3rd Party Product Review Aggregator based in the United States. Not only can users syndicate their product reviews to Google displaying 5-Star Ratings in their PLAs, users can also syndicate existing Product Reviews they’ve already collected by importing existing reviews via CSV. $599/mo: Up to 10,000 accumulated ratings and reviews. The beauty of Shopper Approved is that it’s designed to work with any business, whether you sell online products or services, local products and services, or both. Users are put in touch with collection tools, management systems and distribution channels to help make their business more successful – all with no contracts. You can even collect reviews in private before you display them. Update: Before signing up with Verified Reviews, make sure to ask them if the plans include both Seller Ratings for Adwords and Google Shopping (PLAs) ratings. Enjoy greater visibility of your physical stores. Yotpo promises a lot of stuff including top search results with SEO tools that drive quality traffic to your website. Through Inline technology, users can help you create thousands of new keywords, encourage more qualified traffic and maximize fresh content – all leading to big-time growth in organic traffic. With Rich Snippets, you can also ensure your store gets high SERPs thanks to reviews and ratings optimized for organic search results, displaying ratings in shopper comparisons to other sellers. Visual Marketing: Photo Generation, Rights Management, Content Management, MarketingYotpo is best for online retail businesses. Check out and compare all the Yotpo plans here. You can get a free demo on Pro, Powerhouse, and Visual Marketing. For the purposes of this blog post, you will need their Powerhouse Plan to push your product reviews into Google Shopping (PLAs). Yotpo’s strength is that it’s a complete content marketing solution for businesses that sell products or services online, relying on real-time data and proprietary algorithms to determine the unique needs of each business. Then, it assigns specific tools for those businesses to help get customers to generate original content as part of online product reviews. This customer review platform was built to help instill trust in the end client, focusing on transparency to not only build confidence but retain it as well. You get the tools you need to collect reviews, get new customers, foster relationships, and extend your customer reach. It features some stiff competition from Shopper Approved and Power Reviews, but holds its own pretty well. Enterprise: For companies requiring added data protection and enterprise-level account management. Includes all benefits of the Pro plan plus comprehensive customization and account management, with ability to integrate with in-house business tools. PowerReviews works with about 1,000 global brands and retailers to generate reviews designed to drive traffic, boost sales, and create actionable insights so that shoppers are able to find your products. Many companies like PowerReviews because it can help convert more prospects and elevate online sales, while collecting monthly reviews through customizable designs, category templates and enhanced support. How many monthly reviews you collect will depend on the plan you select. Plans start at $399 per month. HOWEVER, syndication of your reviews into Google Shopping start at the $699/mo Business Plan. Standard ($399/mo): This is the plan to choose if you simply want to grow your content and inbound traffic with ratings and reviews. This plan features Customizable Design, Google Product Ratings, and Inline SEO, with the ability to collect up to 75 monthly reviews. Business ($699/mo): Collect up to 250 monthly reviews. This plan includes everything above plus Higher Limits, Category Templates, Daily Content Exports, and Syndication. Worth mentioning is that Syndication comes standard for retailers but is an extra cost for brands. Custom: This is their most comprehensive plan with extra features and enhanced support, with the ability to collect a custom amount of monthly reviews. With this plan, you get everything in the Business plan plus Higher Limits, Enhanced Support, Customization via API, Additional Features and Professional Services. Call for pricing. All of the above product review companies offer product reviews that will populate in Google Organic and Google Shopping. The one you choose will depend largely on your budget, needs and goals. Note, however: sometimes a CMS like Shopify will have a 3rd party plugin, but if you ever change companies, you’ll probably lose your reviews too. In this case, it’s probably best to have a 3rd party review software outside of the CMS. For example, WooCommerce by WordPress doesn’t work by default; you’ll need a programmer. If you have a service based site like ours, guess what? You can get product reviews for free since you’re not going to syndicate anything into Google Shopping. For example, accounting companies can create service pages like “tax preparation,” “book keeping,” “audits,” “accounting,” and “amending taxes.” Each of these service pages would act as their “product” reviews. 1) Open Notepad and copy/paste this code. 2) Change the numbers, change the Product Name, also put your own <img src=”#”>. 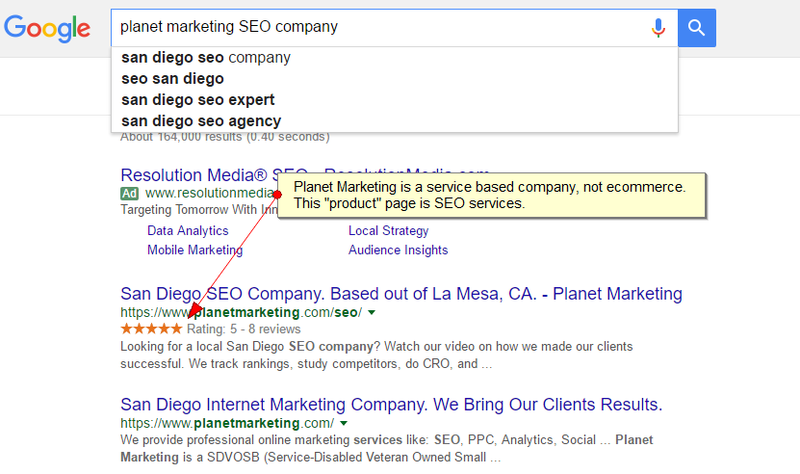 Please don’t use my planetmarketing.com images. Here are the 3 types of stars you will need. Download then upload them into your CMS. Swap out the planetmarketing.com URLs with your own URLs. This system is manual, but at least you don’t have to pay a company to get product reviews. If you can afford it, get one of the companies above to help you automate the feedback. If you have any questions, please ask below in the comments or contact me via live chat. I’ll help you out.